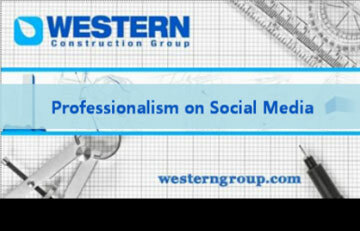 Western Construction Group’s, Senior Director of Talent Management and Human Resources, Mary Faris, reminds us of the importance of how we portray our image on social media. Whether you are a student looking for an internship, a recent graduate hoping to secure a great first job or a seasoned employee working towards that next promotion, you need to be mindful of the types of messaging and photos you are displaying on digital platforms. Social Media platforms are constantly updating their privacy settings, and now, more than ever, potential employers are not only using social media to increase awareness of their own company, but also to research candidates to determine if they will fit in with the company’s culture. 1. Avoid profanity and negative messages about your company or coworkers. 2. Keep up to date on your privacy settings. 3. Be mindful of who you invite to connect with on these platforms. 4. Remove any innappropriate photos or images, and make sure your profile photo represents you in the best light. Stay tuned for more helpful advice and information from Western’s Human Resources and Training team!